Caring for your senior loved one can be both challenging and fulfilling. 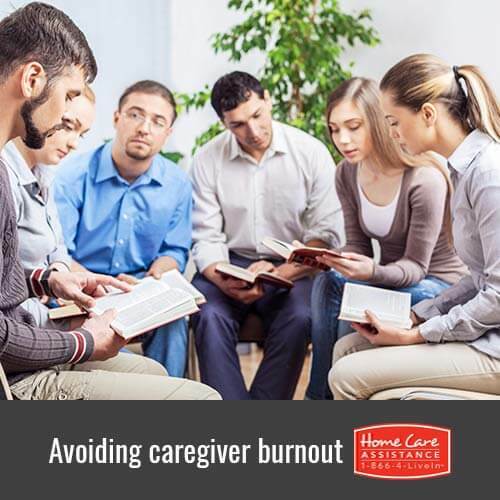 While you take comfort in the care you provide for your family member, it requires a lot of time and dedication that could lead to undue stress and exhaustion, also known as caregiver burnout. Home Care Assistance Orlando knows that balancing your loved one’s care with your own wellbeing can be difficult, but you can prevent caregiver burnout by practicing the following tips. It’s important that family caregivers take time for themselves. Even if you only get away for 30 minutes, it can help you refresh and recharge. You could also take up hobbies like yoga, journaling, and meditation to take your mind off of or manage the stress or emotional unrest you are feeling. Happy caregivers are efficient caregivers, so it’s important to do something that brings you joy. Other caregivers can empathize and understand the challenges and emotions you experience each day. Participating in a support group is a great way to connect with others, ask questions, vent, share ideas and get much-needed support from like-minded people. It also allows you to make connections with additional resources like Orlando home care providers, medical professionals, and outreach programs. Hiring a home care agency that provides live-in or hourly care in Orlando will ensure that your loved one is safe and cared for while you focus on your wellbeing. Many home care providers also have care services that accommodate various illnesses, including Parkinson’s, Alzheimer’s, stroke, and dementia. Your health plays a vital role in caring for a senior loved one, not only because some illnesses are contagious, but because a healthy body and mind can stave off burnout. Be sure to get plenty of sleep and eat nutritious meals each day. Maintaining a balanced schedule of diet, exercise, and sleep will help your body fight off sickness and depression while you care for your elderly family member. It’s only natural to want to be your parent’s primary source of care and comfort, but sometimes in order to protect yourself from burnout you need additional help. Trained Orlando caregivers from Home Care Assistance offer compassionate assistance to seniors with an emphasis on balanced nutrition, regular exercise, and emotional support. Not only will your parent receive comprehensive care and support, but you in turn will be able to focus on your wellbeing and overall health. Learn more about the benefits of at-home care by calling a personable Care Manager at 407.232.7155 today.